10 After school today we had our first Physics Olympics practice of the season. We participate in a league of nine schools that holds three meets per year. At each meet there are two “build-ahead” events and three “rotation” events, plus problem solving. The “build-aheads” require each school to bring completed items to the meet, like a mousetrap car or a catapult. The “rotation” events need to be practiced, because each team gets 25 minutes in a room with a given set of materials and has to accomplish something. 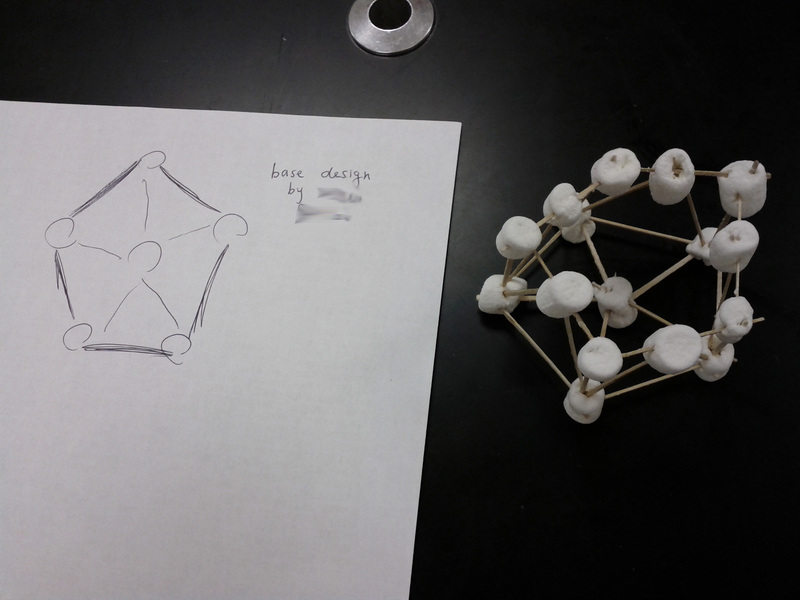 Today one student worked on a module for the “Tower of Marsh” rotation event, in which students have to build the tallest tower with the smallest base, using nothing but flat toothpicks and mini-marshmallows. In future practices, we will see if this design holds up, and develop new designs. This year’s first meet is October 20th.